You know your kids are going to be the cutest ones on the block. After all, you’ve been planning their costumes since before the Fourth of July. Do you really want to trust these precious memories to a telephone snapshot? Of course not. Come on out to the park and let’s do this right. 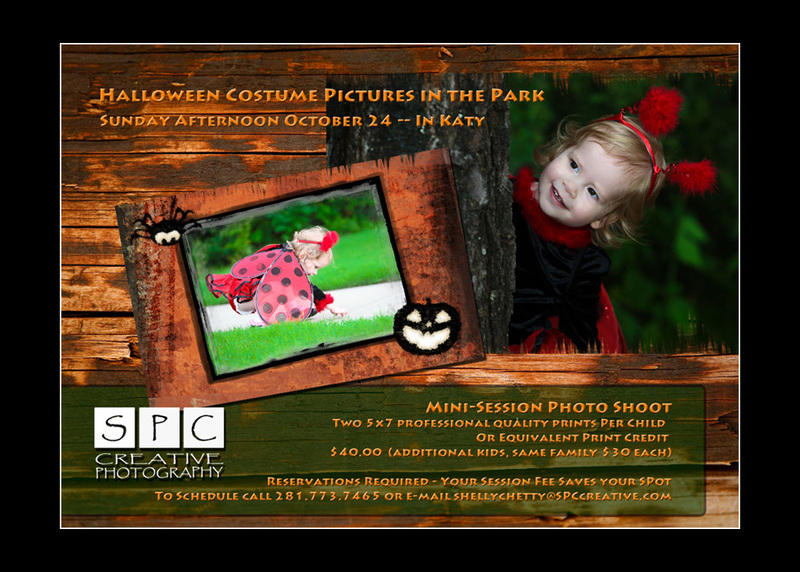 Once you reserve your time slot, we’ll meet at a Katy area park on Sunday afternoon, October 24. The exact location depends upon who signs up and of course, weather and park conditions. Come dressed and ready to go because we’ll only have about 15-20 minutes per child. That’s long enough to relax and mug for the camera, but still quick enough to accommodate most young attention spans. Afterward, you’ll receive your very own online password-protected photo gallery and a coupon for two five-by-seven prints per child or an equivalent value that you can use toward larger prints or gift items. Now that’s one sweet deal! Call 281.773.7465 or e-mail to reserve your time. We’ll have a SPOOK-Tacular time.